Lauren Hall-Gregory, the women’s basketball team’s head coach, during a practice on Feb. 1. She recently earned her 100th win, while the team finished runner-up in the ECAC tournament. After defeating Haverford College in the first round of the NCAA tournament, the men’s soccer team faced off against host team Montclair State University on Sunday, Nov. 11. After Montclair State scored on a penalty kick 12 minutes into the game, the Violets responded as Stern senior Ricardo Mitrano connected with Stern sophomore Matteo Russo, who tied the game at one with 34 seconds left in the half. After a scoreless second half, the game headed into overtime. With neither team able to score in overtime, NYU found themselves heading to penalty kicks for their second straight game. Unfortunately, the Violets fell 5-4 in penalty kicks, which ended their season. In the last game of his NYU career, CAS senior Grant Engel finished with a season-high 10 saves. After making the NCAA tournament for the first time since 2010, the men’s soccer team concluded a successful season. This past weekend, the NYU men’s basketball team hosted the NYU Tip-Off Tournament at the Sportsplex in Manhattan. Squaring off again Sarah Lawrence College, the Violets aimed to start their season 2-0. Up 10 points at halftime, the Violets went on to win 82-66 behind SPS junior Jimmy Martinelli’s 18 points, CAS junior Dom Cristiano’s 14 points and 16 rebounds, as well as CAS junior Ted Georgiadis’ 13 points and nine rebounds. 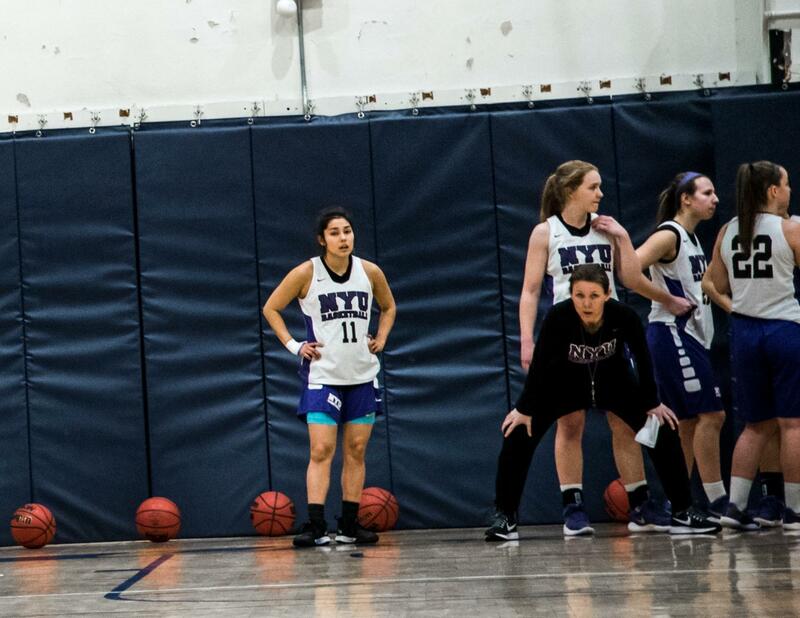 In the championship game of the Tip-Off Tournament, NYU matched up against Baruch College on Sunday, Nov. 18th. Taking a 41-38 lead into halftime, NYU committed 15 second-half turnovers and lost to Baruch by 13 points, 83-70. CAS first-year Alex Casieri led the Violets with 13 points, shooting a perfect 5-of-5 from the field and making all three three-pointers he attempted. Stern first-year Cade Hoppe finished with a team-high nine rebounds and 13 points. The men’s basketball team returns to action on Tuesday, Nov. 20 as they will travel to John Jay College for an 8 p.m. tip-off. After suffering a 10-point loss in their opening game, the NYU women’s basketball team bounced back against College of Mount Saint Vincent and won 78-40, giving Meg Barber her first career win as a head coach. Taking a 37-19 lead into halftime, the Violets continued to dominate, holding Mt. St. Vincent to just six points in the second and fourth quarter. CAS sophomore Lauren Koyama led the Violets with 18 points, as CAS first-year Bianca Notarainni finished with 16 points. The women’s basketball team has the week off before resuming action Sunday, Nov. 25, when they will travel to Smith College for a 3 p.m. game. The NYU wrestling team traveled upstate on Sunday to compete at the New York State Championships hosted by Cornell University in Ithaca, New York. Tandon sophomore James Murdoch led the way for the Violets, winning the 157-pound title and becoming the second NYU wrestler to win a title for his weight class in school history. CAS first-year Cole Karam finished second place in the 157-pound weight class, as CAS junior Jack La Corte placed in third within the 197-pound weight class. Despite bringing just 10 wrestlers, NYU put up 85 points and finished in fourth place out of 24 teams. NYU wrestling returns to the mat on Sunday, Nov. 25, when they will host Stevens Institute of Technology at the New York Athletic Club in Manhattan. The NYU women’s volleyball team competed in the ECAC tournament last weekend, playing in a semifinal and final match on Nov. 11 at Cabrini University. After dropping the first set to Cabrini, the Violets came back to win the next three sets, and captured the match 3-1; 23-25, 25-21, 25-20, 25-23. Playing against the host team, Gallatin first-year Maddie DeJong led the Violets with 16 kills, as Tisch first-year Abby Ausmus tallied seven blocks and CAS junior Jacqueline Kupeli ended with 29 digs. In the ECAC championship game versus McDaniel College, the Violets dominated their opponent and won 3-0 (25-18, 25-17, 25-15). Ticsh first-year Abby Ausmus led the volleyball squad with 12 kills and nine blocks, while Tandon first-year Stella Alverson recorded six aces and 17 assists, and CAS junior Jacqueline Kupeli racked up 17 digs. The Violets concluded their season on a high note, with a final record of 22-16. The team won their last four games, including an ECAC Championship. The women’s swimming team returned to the pool on Saturday Nov. 17 and lost to Johns Hopkins University in Baltimore, MD. The Violets, who are currently ranked sixth in the country, were led by Stern first-year Terra Matsushima, who won both the 100-yard freestyle (53.39) and the 100-yard butterfly (57.67). Stern junior Honore Collins finished second place in the 200-yard breastroke, the 100-yard breastroke, and the 200-yard IM. The women’s swim team will resume action on Thursday, Nov. 29 at the Kenyon College Invitational. The men’s swim team also fell to Johns Hopkins on Saturday, by a final score of 158-104. Currently ranked seventh in the country, the NYU men’s swim team suffered their first loss of the season. Stern sophomore Elan Oumarov won the 200-yard butterfly (1:55:05) and the 100-yard fly (51.74). CAS first-year Graham Chatoor won the 1,000-yard freestyle (9:41.19) and CAS first-year Justin Lum came in first place for the 200-yard breaststroke (2:08.87). The men’s swim team will also resume action on Thursday, Nov. 29 in Gambier, OH.